Through divestment, we aim to break CCA and GEO’s lobbying power by targeting their investors. Because these companies are publicly-traded, the ownership is divided among institutions, mutual funds, trust funds, pensions and individuals. Universities, churches, cities, and states invest in these for-profit private prisons through investment management companies such as Blackrock, Lazard, and Vanguard without even knowing. Thus, many of us have a direct relationship with the private prison industry through employment, tuition, taxes, and/or donations. These institutional investors hold a great deal of power in CCA and GEO: investors can exercise voting rights and, because they have the freedom to buy and sell shares, investors can leave private prisons without leverage to capitalize. Due to the complexity of the financial system, individuals are often disempowered to make any decisions on their retirement funds or mutual funds. Investment institutions manage your money and are the ones that make all the decisions, unless you have a portfolio of over $50 million where your voice is often heard; investors with those types of portfolios are usually universities, states, cities, and some large denominations. 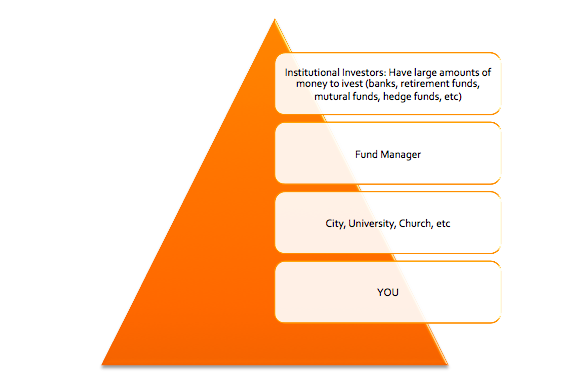 As an individual investor, you or your institutional entity have one intermediary who is often called the fund manager. Your contact is usually a person who is going to give you a choice of portfolios to invest in, but often you cannot pick and choose from one portfolio. Divestment then is at the hands of the top institutional investors. We can pressure our fund manager to pressure the institutional investors to divest from private prisons. The real impact in the industry will be on their ability to underwrite their debt and access capital; therefore we must demand that they cut all ties to the private prisons industry.